Sites of interest lie on a north/south axis so as you travel in one direction you get to see everything. It is a lovely country with the loveliest of people. 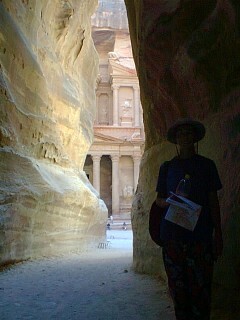 Sites not to be missed are Wadi Rum, Petra and the springs at Hammamat Ma'in. Considering the border crossing point was meant to be busy we were the only ones there. The formalities didn't take long. The visa could be bought there and then for 10 dinars and despite having a carnet de passage we had to buy a temporary import permit for the car for 7 dinars. Car insurance was 14 dinars for one week. The gin in the duty free shop sold at $12 per litre so we bought a couple of bottles and the information office provided us with as much information about Jordan as we could have wanted. All in all, pretty excellent. In Aqaba we found Humam Supermarket which had a good range of foods at good prices and labelled in English so we stocked up for a few days. Then we had the challenge of finding the fuel station. After going around in circles for ages on diesel vapour we eventually found it - there aren't many around. We were so busy smiling with glee at the low cost of fuel and the fact that we had found fuel and avoided topping up in Israel that we didn't realise the garage boys were doing a 'Gambia Special' on us - putting fuel in their mates car and charging us for it. Then they gave us sweets and juice. We thought it was Jordanian hospitality but later thought that they must have felt bad about what they did when they realised we were British. Anyway, the initial road out of Aqaba was poor because of road works but then opened up onto the glorious three lane Desert Highway. In no time we were in Wadi Rum but it was dark and we had missed the sunset. As soon as we were getting our bearings we were invited to someone's home for tea. Apparently it is seen as rude not to go so we went along and sat in a tent in the garden - Bedouin style. The fire was lit, the cardamom coffee brought out then the mint tea arrived. The host disappeared almost immediately but we were entertained by a variety of people taking it in turns to come in and out. It all seemed a bit contrived. Then a French guy arrived and disappeared and the promised scoff failed to turn up. After an hour or two we'd had enough so politely excused ourselves and found what we thought was a secluded camp spot in the desert. The mountains here are huge and sheer. Fabulous. As soon as we had set up camp and cracked open a beer a local Bedouin invited himself for a beer too, but he was alright. Andrew opened the beer before handing it to him as they usually take the can and run off with it - probably to sell it. Wadi Rum is where TE Lawrence was based - of Lawrence of Arabia fame. It is here that the film of donkeys years ago was filmed. The scenery really is spectacular and if this was your first time in the desert it would be a real treat. 4x4 and camel rides are available along with other activities offered to the thousands of tourists who arrive here each year. We just went for a drive around then left to head on to Petra. Entrance into Petra costs 20JD for one day, 25 for two days and 30 for three days. 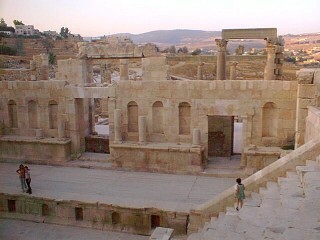 It is expensive but it is the best ancient city in Jordan. 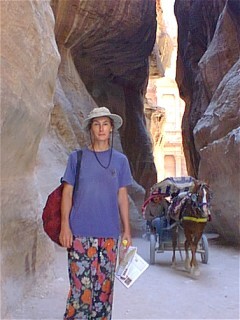 Initially you walk to the entrance of a siq which is a narrow gorge type crack in the rocks. The siq carries on for over a km and is narrow in parts and quite wide in others. It is fantastic with the browns, creams and pinks of the rock. There are occasional trees and along the whole length runs a channel cut into the rock that was previously used to transport water. Eventually you reach the first of the sights and it is the most impressive of the lot - the 'el khazneh', also known as 'the treasury'. People who have seen Indiana Jones and the Last Crusade will have seen it at the end of the film. It is a stunning building cut entirely out of rock. For the next six hours or so we walked around the site taking in the beautifully carved tombs, the spectacular amphitheatre and less obvious ruins whilst trying to imagine what they would have been like years and years ago. Afterwards we were shattered and were glad to get to bed on some mountain top away from civilisation - so we thought. About ten minutes after going to bed the dingaling of bells arrived and stayed with us for the entire night. In the morning 'Turkey' introduced himself and his sheep to us. 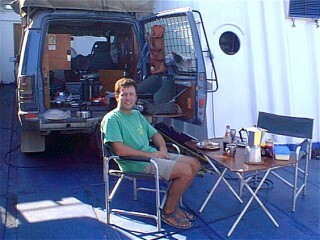 He had camped next to us all night and obviously the offer of tea was just what he had expected. He almost pushed me out of the kitchen in an attempt to get his little kettle on our stove. He was funny though and had breakfast with us. He didn't like eggy bread but liked plain Arabic bread which he fed to the sheep instead of himself. Then he called a few of his animals over so that we got a lesson in sheeps coats, goats coats and more importantly - I was taught where to put your hand so as to discover whether it is a boy or not! Ugh - cold. That afternoon we visited the Dana Nature Reserve and met Rens and Michelle from Holland who are traveling home from the Cape in their Discovery. The Reserve was pretty enough and we had a guide to show us around but we were all too interested in swapping stories with our traveller friends to really appreciate what was going on with the Reserve. It is possible to camp at the Reserve in their tents for 12 JD each or to camp just outside the gates overlooking the Reserve for absolutely free. Of course we chose the latter and spent the evening cooking together, learning of each others adventures and trying to find out what the funny noise was on Rens Discovery. We were right miffed to discover that it is possible to get a Syrian visa from Jordan after all. They had got theirs in four hours with no problems - just had to guarantee they had never been to Israel. Ugh, what a dilemma as trying for a Syrian visa and cancelling the ferry ticket could backfire on us. We had thought that there was no hope for foreigners to get a Syrian visa in Jordan. The next morning we all took a slow drive towards the Dead Sea. The castle at Kerak was surprisingly good value at 1 JD each - the ruins were in quite a good state of repair. 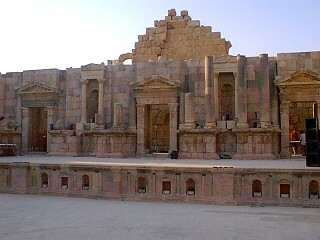 Then we reached what we had been aiming for - Hammamat Ma'in. 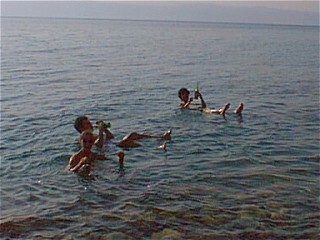 Here you have the Dead Sea on one side of the road and we all went for a float and took our beers with us. On the other side of the road are the springs. A local guy hung around to show us the springs. You have to climb quite high before reaching the cold spring which was actually quite warm and delicious. Just perfect for removing the salty deposits on the skin. After ten minutes or so we moved about three metres down the slope to another pool which had a waterfall on one side and a cave on the other. You go into the cave for a sauna and a lie in really hot water then dash out for a plunge under the cool waterfall. Fantastic to find natural hot and cold springs in the same place. The whole area was full of Muslim men who are not used to seeing women in their swimmers. Seeing a couple of western girls gave them a bit of a thrill. They weren't dressed for the occasion - most had turned out in their baggy white y-fronts (well, they were white at the front). Then our local guy brought a big bag of mud and proceeded to cover Andrew with some of it. Then it was my turn but he got a bit keen on the thigh region - probably couldn't believe his luck. Then it was Michele's turn and she made a pretty smartish exit too. Rens had a go but the boys didn't get much attention compared to the girls! The mud did feel nice though. Afterwards another night of bushcamping on the mountain followed. In the morning we went to Amman to have a quick look around the city. It is set on number of hills and despite the signs being in English as well as Arabic the roads still managed to confuse us. Rens decided to take his car into a Landy garage but it took us a few hours to find it. Once found we met David who is from the UK but works for Land Rover in Jordan. What a find - at last someone who knew what they were doing and we were grateful for his experience and knowledge. The job couldn't be fixed that day so David invited us all to stay at his place. What a treat. Cold beers, hot showers, a washing machine and a very comfortable bed. We were made so welcome and that night went out for a pizza and an opportunity to hear about Davids fascinating adventures. 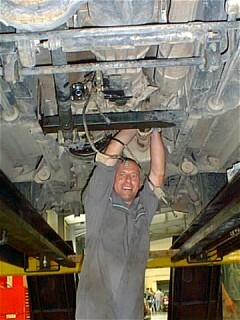 After a lovely nights sleep we were all back at the garage to carry on work on Rens car. Queen Rania's Z8 BMW was in for a service. 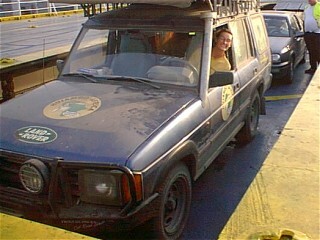 What a beautiful car but we wondered where we could put the roofrack and the jerry cans! There is an eatery opposite the Landy garage which sells fantastic pastries and you can feed and water four people for £2.50! By late afternoon it was time for Andrew and I to move on. If we stayed any longer we would miss our ferry. Very sadly we had to say goodbye to our new friends. We would have loved to have spent more time with them all. 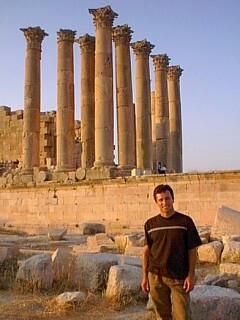 Getting out of town was another thing - not easy but we eventually reached the ruins at Jerash as the sun was low. The amphitheatres there are excellent. That night we camped in some area next to the castle at Ajlun. This was our last night in Jordan and we had camped for free every night - what a bonus. The morning dash for the border was only punctuated by a stock up with cheap Jordanian food and cheap Jordanian fuel. We were very surprised to find fuel at 1.05 JD near to the border - just queue up with the tractors. In town it was twice the price. Soon we were over the border. The Jordanian formalities were fast and the departure tax only 4 JD per person. We were sad to leave but we had thoroughly enjoyed ourselves. Next we crossed back into Israel for a few hours (see section at the end of the Israel page) to get the ferry to Greece. The ferry journey and onwards are described in the next section. Next "Europe - the return"
The VERY friendly (especially when putting mud on the ladies) local chap who showed us the hot springs. David extract the whining box from Rens' Disco Rens finds out what a transfer box looks like. This is normally a good experience except when it's your own. Ren, Jacs, David and Michelle as we say goodbye. Supermarkets are well stocked, have food labelled in English and do not charge silly prices. Didn't try any of the local food other than chawarma. Diesel is cheap at 200 fils/litre (20p). (105 fils at Pella)! You can buy a visa on the border for 10 dinar with no hassle at all and no photos are required. A prior visit to Israel does not preclude entry. Despite reports in guide books it is possible for foreigners to get visas for Syria from Amman, particularly if you are taking a car but only if there is NO evidence of a visit to Israel. The visa can be processed in four hours. Car insurance for one week costs 14.5 dinar and despite having a carnet de passage you are also given a temporary import permit at a cost of 7 dinar.